Gov. 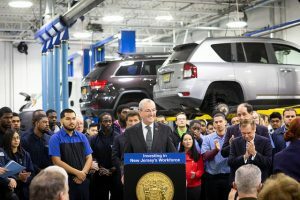 Phil Murphy announced grant awards Monday totaling $2.8 million to seven New Jersey businesses and colleges for training programs that will employ 480 new apprentices within the next 12 months. Gov. Phil Murphy announces $2.8 million in apprenticeship grants to New Jersey businesses and colleges at Sansone Auto Mall in Avenel on Feb. 11. The grant funds support a diverse range of programs. They are designed to promote economic growth by building experience in high-demand industry sectors such as advanced manufacturing, information technology, software development, clean energy and utilities, health care, and more. The funds support high-paying, skilled jobs for which there is expected to be a demand in New Jersey for years to come. The grant recipients will begin or expand apprenticeship programs to train machinists, skilled tradespeople, auto technicians, tool and die makers, medical and lab technicians, chemical technicians, human resources staff, and others. Apprentices will earn at least $15 per hour. Funding comes from the New Jersey Department of Labor and Workforce Development’s Growing Apprenticeship in Nontraditional Sectors competitive grant, which was announced in fall 2018. The GAINS Grant program is part of Murphy’s New Jersey Apprenticeship Network, an initiative that seeks to make the Garden State a leader for apprenticeship programs nationwide, and provide options for all New Jerseyans to build meaningful careers across a wide range of employers. The grant recipients are: the New Jersey Community College Consortium at $983,825; the New Jersey Manufacturing Extension Program at $596,000; Montclair State University at $523,280; Motor Management Corp. at $440,000; ApprenticeIT at $169,290; Interplex at $93,910; and Employers Association of New Jersey at $24,000.